Worcester, MA Shawmut Design and Construction completed Worcester Polytechnic Institute’s (WPI) Foisie Innovation Studio and Messenger Residence Hall. The 78,000 s/f, $47.7 million ground-up building opened its doors in fall 2018, after breaking ground in May 2016. 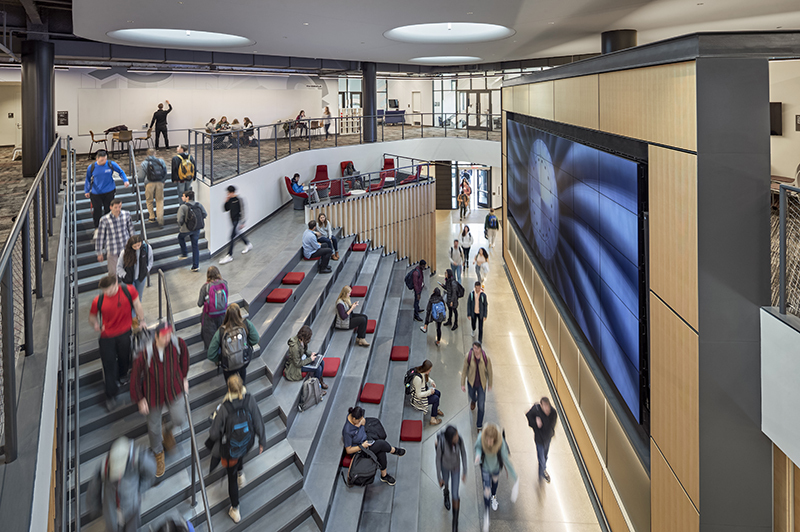 Developed in partnership with architectural firm Gensler, the new five-story, residential and classroom facility offers forums for collaboration between faculty, students, and external partners, as well as new opportunities for sharing physical and digital work. As a physical manifestation of WPI’s project-based approach to STEM higher education, the first two levels of the facility, known as the Foisie Innovation Studio, are intended for student project work. A variety of academic spaces, ranging from high-tech classrooms to an innovation and entrepreneur center, encourage interaction among students. A robotics and global impact laboratory, makerspace, technology suites, and business incubators enhance student and faculty collaboration. A main focal point of the space is the atrium with a two-story virtual feature wall. The three-floor Messenger Residence Hall sits atop the Foisie Innovation Studio. This co-ed, 140-bed student residence is configured into double and single rooms. Each floor also contains two multi-gendered bathrooms, two gender-inclusive bathrooms, tech studios, and open lounges to ensure students have the premiere space to immerse themselves in their education. Targeting LEED Gold certification, the project team designed the new campus hub ensuring a 50% reduction in energy cost-savings. Selecting environmentally conscious material was imperative throughout the construction, including items with low VOC content, recycled materials, local materials, and Forest Stewardship Council-certified wood products. Daylight was optimized with the installation of a low 0.48 W/ft2 lighting power density system. Furthermore, the team initially measured and verified water consumption and assessed indoor environmental quality, leading to the installation of demand-controlled ventilation in the academic areas of the building, ducted fresh air in the dormitory, and low-flow fixtures to reduce water consumption. The spaces throughout the building are named after numerous university benefactors, including: the McDonough Maker Space and Fitzgerald Prototyping Lab, Aberdale Active Learning Classroom, Oliver Active Learning Classroom, Noiles Teaching Laboratory, Class of 1964 Connections Gallery, Global Lab with Scherer Video Recording Suite, Martin Entrance, and the Innovation & Entrepreneurship Center. The building itself is named in honor of the late of Robert A. Foisie ’56 and for Priscilla and George Messenger ’51. 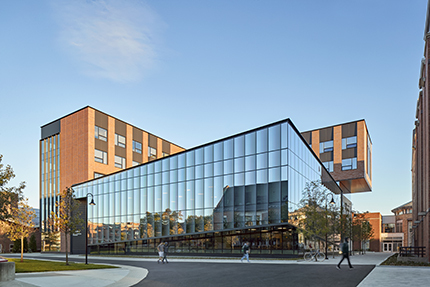 Shawmut’s work on WPI’s Foisie Innovation Studio and Messenger Residence Hall represents the latest in the firm’s extensive academic portfolio, with current projects at Harvard University, Tufts University, and Brown University.